Mine and explosive remnant of war casualties occur in every region of the world, causing an estmated 15,000 - 20,000 injuries each year. Increasing numbers of casualties are the result of local recycling of unexplosed ordinance for its scrap metal value. Of casualties reported in 2006, Afghanistan, Cambodia, and Colombia make up nearly 40 percent. There are 350,000 - 500,000 survivors around the world today. Many survivors face widespread discrimination and are often among the most impoverished groups in society with limited access to health care and economic assistance. Attention to survivor assistance is increasing; however, funding remains inadequate. Sixty countries have mine risk education programs providing communities with information about safe behavior around mines, and training to identify and report dangerous areas and injuries. Mine risk education is especially important for children, who too often mistake mines and unexploded ordinance for play objects. 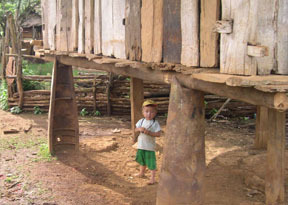 The foundation of this house in Laos is recycled ordnance. 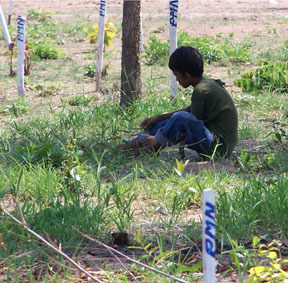 A boy plays among the stakes that record where mines were found in a cleared Cambodian minefield.